Keep Your valuable stethoscope and medical exam equipment protected and in one place. Ideal for travel between offices , home visits or everyday storage. The case has a rubber seal that goes around the box to prevent water , dust moisture and other debris from dirtying your medical supplies. This case is constructed from durable hard plastic that resists being crushed. The interior is lined with a dense foam top and the bottom has a rubber insert to help absorb impacts. Feel confident knowing your equipment is safe when in bags traveling through the airport , vacation and more. The case firmly snaps shut with two durable latches. Exterior dimensions measure 9" x 5.5" x 2.5" so it can conveniently and discreetly be carried in any backpack , bag or large purse. This case is ideal for professionals or home use. 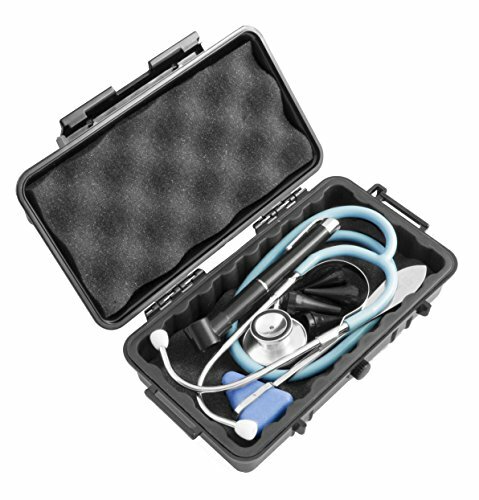 The interior usable dimensions of this case are 8.2" x 4" x 2.2" allowing room for a variety of everyday medical exam tools . It easily fits one coiled stethoscope , led otoscopes , percussion hammer and more. Coil your stethoscope so it sits on the padded rubber bottom and other tools can be laid gently on top. The impact absorbing padded foam lid keeps all devices in place and prevents vibration. Ideal for keeping your medical examination supplies organized during travel and in one place , exterior dimensions measure 9" x 5.5" x 2.5" and Internally fits devices within 8.2" x 4" x 2.2"